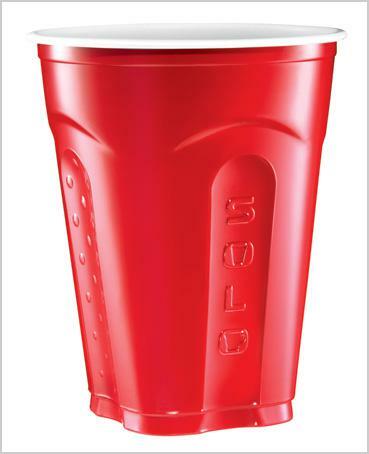 Red Solo Cup: How Solo’s disposable drink vessel became an American party staple. How the disposable drinking vessel became an American party staple. A short while back I was walking through a grocery store when I noticed a radical development. The classic red Solo cup—a keg party staple for nearly four decades—had switched from a round to a square bottom. This seemed unnatural. Could it be true that college students across the nation were experiencing a wholly different world from the one I’d known? So ubiquitous were these plastic cups in my undergrad days, tweaking them in even the slightest fashion would have altered my entire visual landscape. It’d be akin to a Manhattanite awaking one morning to find New York City’s yellow cabs had all been painted fuchsia. So quintessentially American is the red Solo cup, it is available for sale through a specialty website—Party Cups U.K.—targeting British revelers who wish to re-create the ambience of a land-grant university frat house. The site sells nothing but red Solo cups, and every order includes printed rulebooks for Beer Pong and Flip Cup, which the home page informs us are “the Americans’ drinking games of choice.” With a veritable national icon on its hands, why would Solo risk changing the design? The company itself boasts a rich history. This fall marks the 75th birthday of the Illinois-based Solo Cup Co., which first made its mark in the 1940s with a small paper cone that often perched on the sides of office water coolers. In the 1950s, Solo made wax-lined cups that proved ideal for the takeaway fountain sodas served at drive-in movie theaters. Nowadays, the company manufactures all manner of single-use dinnerware, cutlery, and beverage receptacles. Its products are found in supermarkets, convenience stores, coffee shops, and fast food restaurants across the globe (as well as in the White House Situation Room). But it remains best known for the red party cup, which launched in the 1970s. So perhaps first-mover advantage played a role, with followers clamoring to emulate Solo’s technological breakthrough? For surely the quality of the design played a part. From the beginning, this has been the Sherman tank of disposable mealware. Made of thick, molded polystyrene, the Solo party cup could be squeezed in meaty frat-guy paws, dropped to the ground by tipsy highschool cheerleaders, and mercilessly battered by Flip Cup contestants—all while maintaining shape and functionality. It was stiffer and more resilient than competitor party cups like Dixie’s. No doubt the cup’s opacity was a selling point for underage college and high-school drinkers who would prefer not to reveal exactly what they’re sipping. But why red? Healy says the red-colored cups make up 60 percent of Solo party cup sales, with blue cups a distant second. “I’ve been here 12 years, and I’ve tested this over and over. Consumers prefer red, and it’s not very close. I think for one thing it’s a neutral color that’s appealing to both men and women. It’s also just become a standard.” Perhaps it is a psychologically ingrained preference, as well. Some color theory holds that red signifies concepts like energy, passion, and emotional intensity, while blue is linked with tranquility and depth. I know which set of associations I’d rather trigger at my drunken beer blast. Solo keg cups also hold a bit more liquid than the competition. They boast an 18-ounce “flush fill” as opposed to the 16 ounces offered by some competitors. (Healy explained that “flush fill” numbers measure the amount you could pour right up to the rim, while the “practical fill” stat shaves off two ounces to allow for ice cubes and spill avoidance.) Most partiers will agree: More is better when it comes to beer-containment capacity. The evolution of the Solo party cup: On the left, the first model that emerged in the 1970s. In 2004, the cup got two grips (center). In 2009, the cup changed again, hitting the market with a square base and four grips. Healy says the two design changes each spurred double-digit sales growth, so, mission accomplished. But I actually prefer the aesthetics of the original red cup (you can see it pictured in this Solo timeline, next to the label “1970s”). The current cup strikes me as a victory of function over form—a clunky, overdesigned beast. There are multiple carved-out hollows offering purchase for sweaty fingers. Thickly embossed “SOLO” logos running down two sides. There are even bumpy dimples to help maintain grip. It’s a bit of a mishmash, lacking the spare, sleek lines of its classic forebear. Stylistic quibbles aside, I had one vital question: How might the new shape affect the product’s famous role as a Flip Cup accessory? Healy wouldn’t take the bait when I asked her if such concerns were factored into the redesign. “We don’t market the cups that way,” she said, “and we count on our customers to use them responsibly.” Sure, sure. But that doesn’t help the Flip Cup assassins out there—the dudes and gals who need to know if this newly square bottom will alter the delicate balance of the cup. Will the same, subtle nudge still induce the elegant mid-air somersault that results in a clean landing? I have been flipping cups at my desk all day (much to the puzzlement of nearby co-workers), and I can now assure you that there is absolutely nothing to worry about. Flip Cup with a square-bottomed Solo is the same game. So flip away. And if you see Toby Keith, best to lift your Solo cup high in a toast—to let him know you don’t drink from a glass.